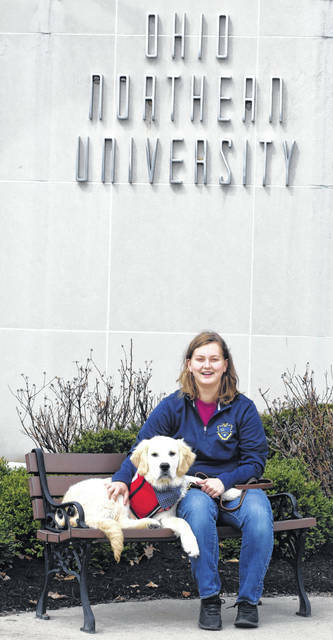 Ohio Northern University student Carah Porter works with a medical training dog, Chimichanga, in front of the Freed Center on the Ada campus. Asher Longmeier, 3, and his family are currently working with 4 Paws for Ability to raise $17,000 for a task-trained autism awareness dog. Chimichanga, seen here with Ohio Northern University student Carah Porter, is destined to help a family with specific needs. 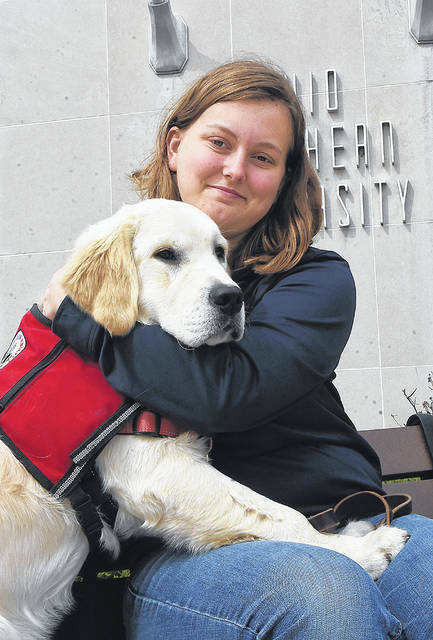 Carah Porter and other students in the Polar Paws bring service dogs they’re training everywhere with them, including classes, meals and sometimes even graduation. Service dogs have become much more than emotional support animals or trusted companions for some families or individuals. There are now task-trained service dogs that can detect a change in insulin levels or recognize the start of a seizure — but they come at a hefty price. 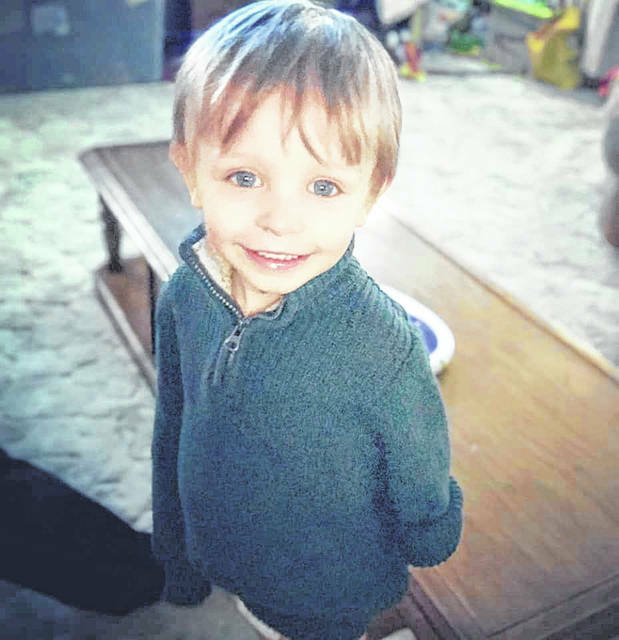 The Longmeier family, of Bath Township, is currently fundraising for an autism awareness dog for their 3-year-old son, Asher, who was diagnosed with autism at 18 months. For the Longmeiers, what they are getting out of the service dog is well worth its price tag. They’ll have to raise $17,000 of the up to $60,000 it costs to train one. But the Longmeiers and their 4 Paws for Ability match are just beginning the process. Kylie Longmeier originally heard about task-trained dogs from an Ohio Northern University student who shadowed her work at Mercy Health-St. Rita’s Medical Center. 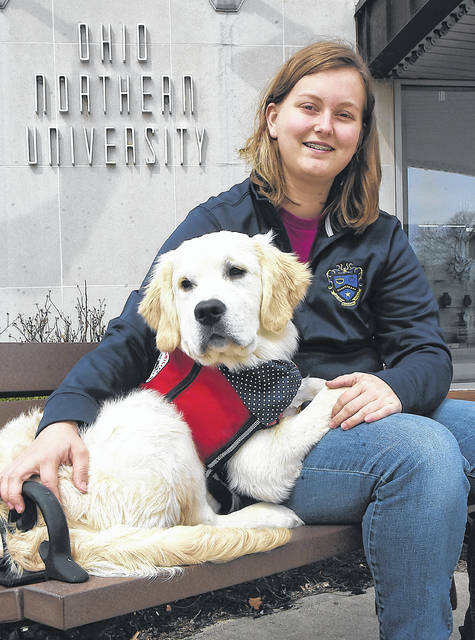 The student was part of ONU’s Polar Paws program, a volunteer-based organization that fosters dogs in partnership with 4 Paws for Ability, a facility based out of Xenia. 4 Paws for Ability is one of the leading providers for these task-trained service dogs. The group recently appeared in the Netflix docu-series “Dogs” in the first episode, detailing a young girl’s journey with epilepsy and her service dog. The dogs like those found at 4 Paws for Ability are not just any other dogs. They are bred and go through a life of extensive training to help the individual to whom they’re assigned. Once families decide to go the route of obtaining a task-trained service dog for 4 Paws for Ability, they have to begin the fundraising. According to KaLynn Clark, the director of volunteer engagement, it can cost 4 Paws for Ability between $40,000 to $60,000 to train and place a service dog. The fee for a service dog placement with those like the Longmeiers is $17,000. The Longmeier family contacted 4 Paws for Ability last summer and began fundraising at the beginning of the new year once the application process was complete. She started a Facebook donation page, Four Paws for Asher, in February with a goal of $10,000 that has already been met. The family is still in the process of planning a golf outing fundraiser next month to hopefully reach the $17,000 goal. All the while, the puppies at 4 Paws for Ability begin their training in the puppy house, where volunteers work on basic commands and “making a confident little puppy,” Clark said. 4 Paws for Ability continuously breeds and carries out the training process for the dogs from birth so they have options ready and available for placement. Upon graduating from the puppy house, they will go into a foster program. 4 Paws has partnered with local prisons and colleges, where the dogs can get acclimated with larger groups of people and continue basic command training. Because 4 Paws for Ability does not have a minimum age requirement to place a dog, they end up working with a lot of placements with children, said Clark, hence the reason behind partnering with local colleges such as Ohio Northern University. Polar Paws currently has nine dogs on campus that live with volunteer handlers, even in the university dorms. Carah Porter, vice president of Polar Paws, said the volunteer handlers take the dogs with them to any classes that aren’t in a lab, to the cafeteria, to sporting events and even to musical performances. Polar Paws also partners with local organizations to bring the dogs to, getting them adapted to larger groups and new people. The group often goes to local libraries or elementary schools so the kids can read with the dogs. Clark said the Polar Paws dogs can remain on campus anywhere from four days to a year and a half. When the dog reaches 1 year, it will be called back to 4 Paws for Ability for training evaluations. Once ready, the dogs will be pulled for specialized task training for another six months. The kinds of service dogs that 4 Paws for Ability go further than emotional support animals. These dogs can be task-trained in different categories, depending upon the needs of the person they are paired with, from mobility and hearing assistance to behavior recognition in those with autism and seizures. 4 Paws for Ability also trains dogs to workalong side veterans, those with diabetes or seizures and even children diagnosed with fetal alcohol spectrum disorders. They can also offer a multipurpose assistance dog for those with a disability not addressed by one of the other categories or who may go between multiple. Diabetic alert dogs can be trained to smell chemical body changes that occur when insulin levels increase or decrease and change a person’s scent. Another aspect that the dog can be trained to do is behavior intervention. It can be trained to detect behavioral or physical changes, but this is where the training between the dog and its human becomes crucial. Once families complete the fundraising required to reserve a task-trained service dog and a match of their current group of dogs available has been identified, the family travels to Xenia for a two-week class. The class is designed not only for the human to get acclimated to the dog but for the dog to get acclimated to its new companion’s behaviors. “There’s training for the dog to learn the behavior with the child, like if they pull hair or lash out on their family. The dog can disrupt tantrums through things like deep pressure, nuzzling or tethering,” Clark explained. The main reason the Longmeiers are seeking the dog for Asher is for tethering purposes. The dog will wear a harness that a leash is attached to for the child to hold or to be attached to a belt or backpack the child can wear. If Asher does happen to slip away, the dog can also be trained to track him. His family is also hoping Asher’s dog will be able to take part in behavior intervention. One thing the Longmeiers aren’t sure about is how Asher’s dog will get along with his brothers, ages 11, 7 and 1, and current family dog, Frank the Pug. Once Asher’s placement has been identified, the family will have to maintain the dog’s certification and training on a yearly basis. According to 4 Paws for Ability, the cost is about $1,500 to $2,000 each year to maintain a service dog.